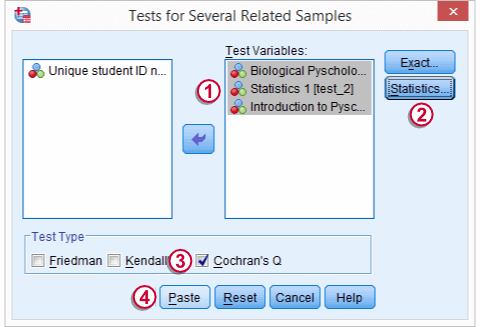 SPSS Cochran Q test is a procedure for testing if the proportions of 3 or more dichotomous variables are equal in some population. These outcome variables have been measured on the same people or other statistical units. The principal of some university wants to know whether three examns are equally difficult. Fifteen students took these examns and their results are in examn_results.sav. It's always a good idea to take a quick look at what the data look like before proceeding to any statistical tests. We'll open the data and inspect some histograms by running FREQUENCIES with the syntax below. Note the TO keyword in step 3. 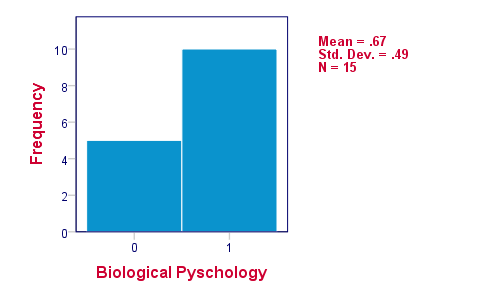 The histograms indicate that the three variables are indeed dichotomous (there could have been some “Unknown” answer category but it doesn't occur). Since N = 15 for all variables, we conclude there's no missing values. Values 0 and 1 represent “Failed” and “Passed”.We suggest you RECODE your values if this is not the case. We therefore readily see that the proportions of students succeeding range from .53 to .87. This results in the syntax below which we then run in order to obtain our results. The first table (Descriptive Statistics) presents the descriptives we'll report. Do not report the results from DESCRIPTIVES instead.The reason is that the significance test is (necessarily) based on cases without missing values on any of the test variables. The descriptives obtained from Cochran's test are therefore limited to such complete cases too. the proportions range from .53 to .87.Again, proportions correspond to means if 0 and 1 are used as values. The table Test Statistics presents the result of the significance test. The p-value (“Asymp. Sig.”) is .093; if the three tests really are equally difficult in the population, there's still a 9.3% chance of finding the differences we observed in this sample. Since this chance is larger than 5%, we do not reject the null hypothesis that the tests are equally difficult. When reporting the results from Cochran's Q test, we first present the aforementioned descriptive statistics. Cochran's Q statistic follows a chi-square distribution so we'll report something like “Cochran's Q test did not indicate any differences among the three proportions, χ2(2) = 4.75, p = .093”. Sorry for my late response but I finally had the time to look into this. The difference occurs because -by default- the McNemar test reports an exact p-value and the Cochran's Q test reports and approximate ("asymptotic") p-value. So if you request the exact p-value for Cochran's Q test, the outcomes are identical. I ran all tests on your data and the syntax is accessible at McNemar Test Versus Cochran Q Test. I added the conclusions at the end. Hope you find it helpful.